Any Video Converter Ultimate is an all-rounded video converter, DVD ripper, DVD burner, screen video capture, YouTube downloader & converter, video editor, etc. As a professional video converter & DVD ripper, it provides handy and useful solution to free convert video & rip DVD movies to all popular video and audio formats, including AVI, WMV, MP4, FLV, SWF, MKV, 3GP, 3G2, MP3, OGG, etc. If you want to play DVD movies on your iPhone, iPad, PSP, Android Devices and other portable devices yet have no idea about the proper solution of how to rip DVD. Just feel free to take a try of Any Video Converter Ultimate, which will give you the opportunity to enjoy your DVD movies on a number of portable media players and smart phones including iPhone, iPad, iPod, PSP, Android Devices, etc. The following is a brief guide on how to rip DVD to iPhone, iPad, PSP, Android and any other portable devices with Any Video Converter Ultimate. First of all, please download Any Video Converter Ultimate, run the program. Step 1 : Insert a DVD you want to rip into the program. Put the DVD to your computer DVD driver. Simply click the Add DVD button, It will start scanning your DVD, you can also choose skip. Choose the proper profile that suits you best from the drop-down list of Output Profile option on the top right corner. Note: If you’re ripping DVD to iPhone/iPad/iPod/Apple TV, please choose Apple Products and get your preferred output formats. 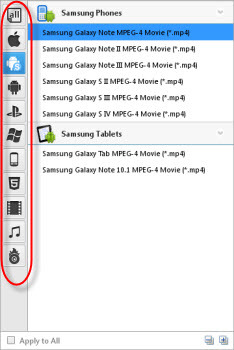 If you’re ripping a DVD to Android devices, please choose Android Products, and get your preferred output formats. If you’re ripping a DVD to PSP/PS3/Sony Walkman, please choose Sony Products and get your preferred output formats. Tips: You can also change the settings (Basic Setting/Video Options/Audio Options) in the right panel as you wish. 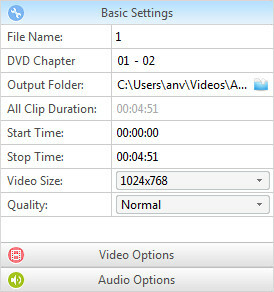 -- On the Basic Settings, you can specify the chapters, change the videos size, quality, and set the Start Time and Stop Time of the DVD movies you want to rip. -- On the Video Options, you can set the Video Codec, Video Bitrate, Framerate, Video Aspect and Encode Pass. -- On the Audio Options, you can set the Audio Codec Audio Bitrate, Sample Rate, Audio Channel, etc. 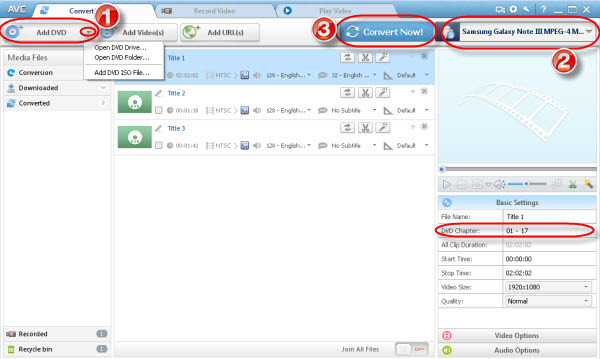 If your DVD movie contains multiple audio tracks, you can freely select your desired ones from main panel of the program. If your DVD movie contains multiple subtitles, you can also choose your desired subtiles from main panel of the program. Step 3 : Click "Convert Now!" button to start ripping DVD. Once everything is ready, you can click on Convert Now! to start ripping DVD. If you would like to cancel encoding, please just click the Stop button and click Yes in the pop-up window then the encoding will be stopped. Now you can enjoy DVD movie on your iPhone, iPad, PSP, Android and etc. freely!